Sister restaurant to the well loved, Cinnamon Spice, Mohammed Rahman’s Spice of Hampstead features the same high quality Indian cuisine. This modern and bright restaurant offers a light, modern take on Indian cooking that is confidently prepared and presented. The ambience is relaxed and pleasant with the dining room having an intimate feel. The restaurant made Time Out’s top 100 Indian restaurants in 2002, and has won two top awards since. A year earlier, Spice of Hampstead’s chef won the Curry Chef of the Year Award in 2001. This is a family run business, so you can expect a high level of service in addition to their award winning food. 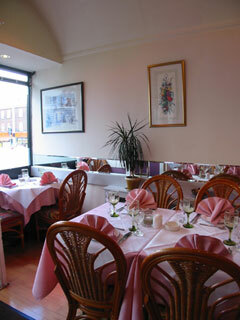 Spice of Hampstead is small and intimate and can accommodate parties of up to 32 guests. A good choice for a business lunch, Christmas party, birthday or family get-together if you live or work locally. Party menus are available and the restaurant can create a menu for your own party upon request. Service is charming and friendly. This restaurant is family friendly so feel free to bring your little one�s along. The menu contains a banquet of traditional as well as some new innovative Indian dishes from various regions, with many vegetarian choices. The tandooris and baltis are very popular here. Choose from tropical fish dish Machli Biran from Bangladesh, Persian lamb Dansak, and Malay chicken, with the mildest of spices to terrifyingly hot. The wine list consists of a healthy selection of world wines.